Many anglers are turned off by fly-fishing because they think it is too technical. Oftentimes, experienced anglers try to impress new fly fishers by spouting off about the “Baetis hatch” or talking about the “Ephemerellas” they saw yesterday. It can seem a bit overwhelming for a beginner, and learning the Latin names of all the insects one encounters on-stream seems a daunting task. Fear not, because the fish know less Latin than you do! What is important when fly-fishing is to be observant. 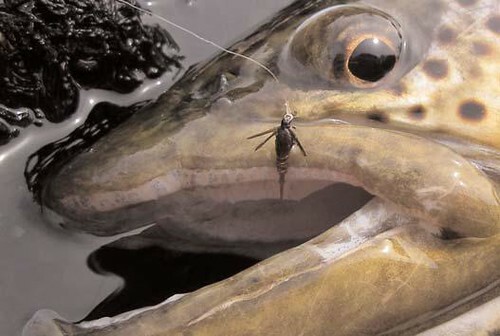 If you see the fish are eating small olive-colored bugs with gray wings, that is all the information you really need to select an appropriate fly. Simply look into your fly box and pick the fly that best represents the natural insects. You don’t need to know that you are in the midst of a Baetis hatch. Rather than taking courses in Latin, taxonomy, and entomology, there are a couple of things you can do to to find out what available food items the fish might be taking advantage of. 1. Shake some of the streamside bushes, watch what flies out, and match these creatures to an imitation in my fly box. The bugs in the bushes are usually those that have recently hatched or are about to mate and die. 2. Turn over some rocks. If there are no bugs in the bushes and you don’t see any fish rising, then you can look for food sources under the surface of the stream. Shallow areas with some current are a river’s food factory. Try picking up a few rocks from the river bottom or holding a fine meshed net downstream while stirring up the bottom a bit. You will find lots of potential food items on the local trout’s menu. Take a look at these creepy crawlies and select your fly accordingly. 3. Collect some bugs in film canisters filled with rubbing alcohol. (If you use river water, you will be surprised at how much stink can come out of a small film canister filled with rotten bugs!) A local fly shop or club can be invaluable in helping you identify your drunken-bug collection and select those flies that imitate your collection and work for local hatches. Over time, you will begin to pick up the names of the important local bugs, learn when these insects hatch, and know how to be prepared with the right patterns. latin name of the bug it represented. You have to impress the fish, not other anglers, and trout do not study Latin. Steve May is a fly-fishing guide at Grand River Troutfitters, as well as an Orvis contract fly tier.